When I have a sweet tooth craving it tends to be for dark chocolate. 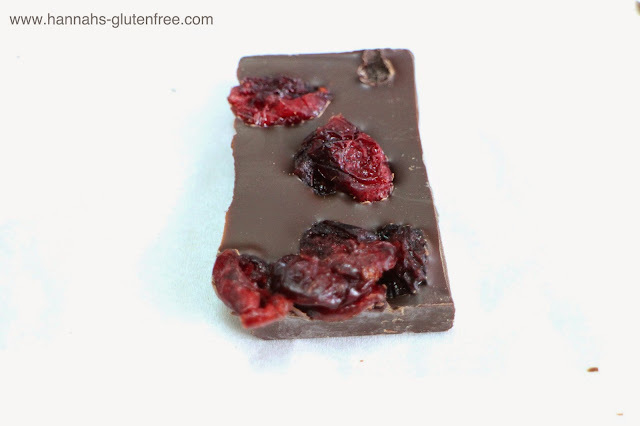 This Plamil organic orange chocolate with cranberries certainly fixed a few cravings for me this week! 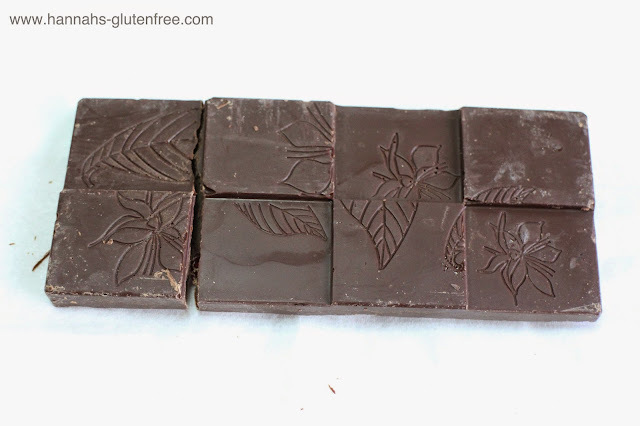 This 50g bar of chocolate is gluten free and certified nut free, vegetarian, vegan and organic. That's a lot of logos to fit on one little bar! The factory runs on 100% renewable energy too. This whole bar contains 267 calories but I personally got three servings from this one bar, so for a sweet treat it isn't too calorific. The chocolate was a 60% so was not too bitter. I love dark chocolate but once you get above 75% I feel it gets way too dry. At 60% this was bitter enough to compliment the other flavours. I would not be doing this chocolate justice if I were to say it reminds me of a dark Terry's chocolate orange as the quality of this bar was superior to that by miles but is the closest thing I have tried that I can compare it to. Orange oil is distributed evenly throughout the bar and is just the right amount, enough to give an orange flavour to the bar but not overly so to the point of overwhelming the chocolate. The chocolate itself has a fabulous snap, which to me is a sign of great quality. What I found the most interesting about this bar is the embedding of the juicy dried cranberries. I am a Hotel Chocolat lover so I am not a stranger of slabs of chocolate having other things embedded in the top, but typically it's more chocolate! The cranberries made a nice change, I have been really enjoying the ocean spray dried cranberries infused with juice, so really suited what I have been eating lately. Being a Kent girl myself, finding out that these bars are produced in Folkestone is really fantastic as it is truly local produce for me! It's quite funny that it came in my Snackly box really, as it has had a bit of a round about journey! Looking at all of their products online, they have a wide range of free from chocolate and confectionery spreads, there is even a egg free mayo! I am certainly interested in trying more from the range as they do have some very interesting products! If you wanted to have a look for yourself, you can find their website here! *sorry for the awful images, office lighting and rainy days don't mix!